Make your own challah, round or braided. 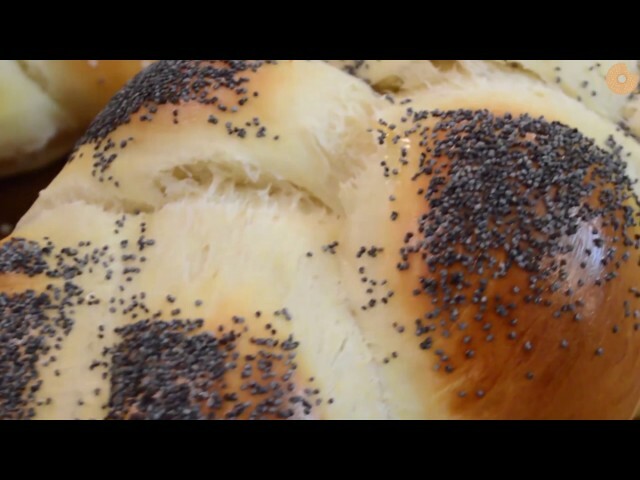 For a variety of challah recipes, ranging from Honey Whole Wheat to Double Chocolate Chip to Gluten-Free, go to The Nosher, MyJewishLearning’s lively food blog. To make round challah: Take 1 piece of dough, roll it between your palms, and pull it out into a long fat rope about 18 inches (46 cm) long and 2 inches (5 cm) thick – a little fatter at one end. Take the fatter end and put it in the middle of an oiled baking sheet, then coil the rest of the rope around it like a snail. Continue with the remaining 3 pieces. To make braided challah with 3 strands: Divide 1 piece of the dough into 3. Roll each piece between your palms and pull into long thin ropes about 18 inches (46 cm) long and 1 1/4 inches (3 cm) wide. Pinch 1 end of all the strands together and plait them: bring the rope on the right over the middle one, then bring the one on the left over it and continue to the end. Pinch the ends together and tuck them under the loaf. You may find it, easier to begin plaiting in the middle of the 3 strands and plait towards the 2 ends. Continue with the remaining 3 pieces. Place the 4 loaves on well‑oiled baking sheets, leaving plenty of room for them to expand, then leave to rise for 1 hour, or until doubled in bulk. Now brush gently with the beaten egg yolks or if you want to sprinkle with poppy or sesame seeds, brush first with the whole beaten egg (the seeds stick better if the white is there too). Bake in a preheated 350F (180C) oven for 30‑40 minutes or until the loaves are beautifully golden-brown. They are done if they sound hollow when you tap the bottoms.